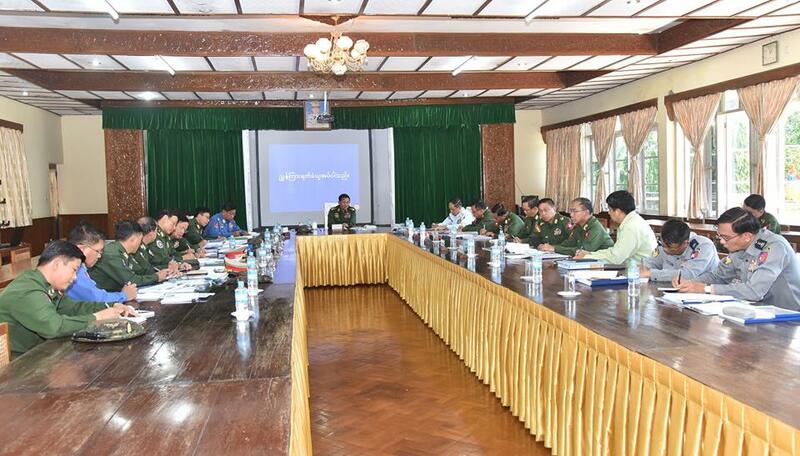 All must have the awareness of the country’s political, economic and military situation and strictly abide by the discipline to become the Tatmadaw reliable for the people and the State. Blood is always thicker than water among the national races. Tatmadaw is formed with the national races of the length and breadth of the country. 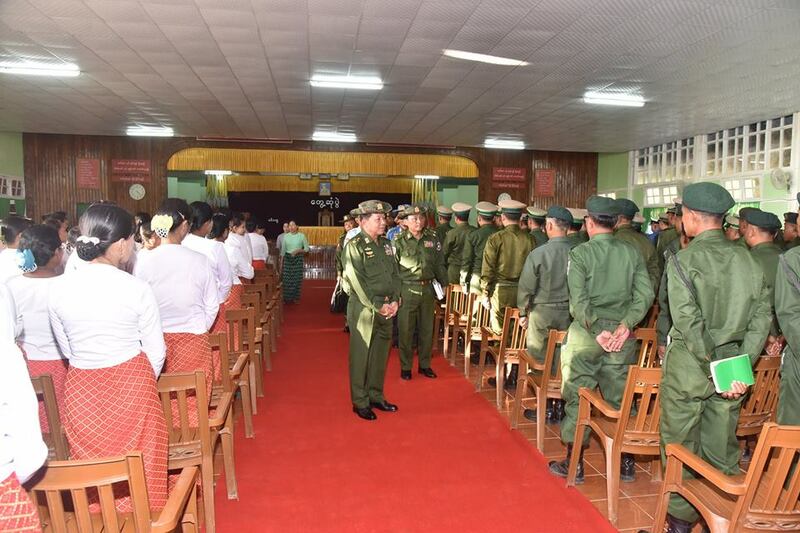 So, the Tatmadaw must be indivisible with the people and serve the interest of the people, said Commander-in-Chief of Defence Services Senior General Min Aung Hlaing at his meeting with officials and other ranks and families at Sittway Station this evening. 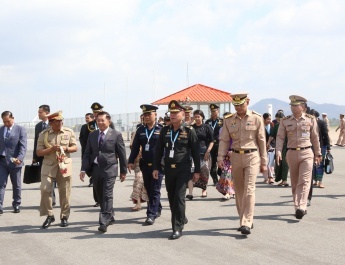 First, the Senior General, accompanied by Commander-in-Chief (Navy) Admiral Tin Aung San, Commander-in-Chief (Air) General Khin Aung Myint, and senior military officers of the Office of the Commander-in-Chief, arrived at Regional Control Command Headquarters (Sittway) this afternoon. 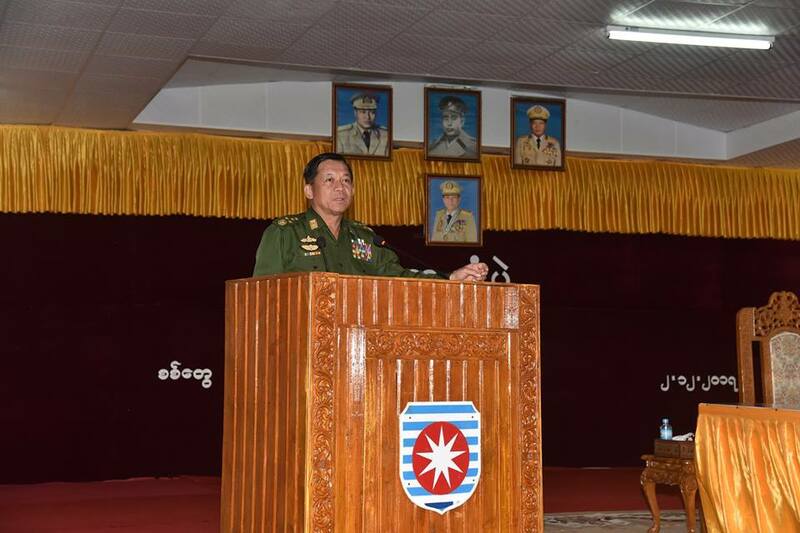 At the meeting hall, Commander of Western Command Brig-Gen Soe Tint Naing presented a brief account of the area security and stability undertakings in Rakhine State, the deployment of security forces, repair of the existing fence and fencing of the new one along the Myanmar-Bangladesh border, and relocation of persons who left homes. In response, the Senior General said security of the local national races must be ensured systematically. The information on the movement of the Bengali terrorists should be acquired without fail for constantly implementing the task of ensuring area security and control and the rule of law. Effective efforts should be made in conjunction with the administrative personnel of Rakhine State government to generate job opportunities. The acceptance of Bengalis who ran away to the other countries must be carefully scrutinized according to the bilateral agreement between the two countries. The returnees must strictly abide by the existing laws of Myanmar. Thorough examinations should be made to ascertain that the lists are correct. It is important that Tatmadaw, police force and all departmental staff should be indivisible with the people. In the afternoon, the Senior General met with officers and other ranks and their families at Sittway Station. It was attended by Daw Kyu Kyu Hla, wife of the Senior General, Commander-in-Chief (Navy) Admiral Tin Aung San, Commander-in-Chief (Air) General Khin Aung Myint and senior military officers from the Office of the Commander-in-Chief (Army), the Western Command Commander and officers, other ranks and their families from Sittway Station. In his speech, the Senior General said the main duty of the Tatmadaw was to perform the country’s defence duty. Myanmar gained its independence more than 70 years ago. During that period, Myanmar lagged behind in development in comparison with other countries. The Tatmadaw saw less development in comparison with those in neighbouring countries even though the Tatmadaw saw tangible progresses from the socialist period, the Tatmadaw government and the current period. The reason was the country experienced unstable political paths and political struggle throughout the post-independence period. Due to the weaknesses of the 1947 Constitution, there were demands for the federal system. As a result, there were politically rift, disunity, unrest and internal insurgency. The Tatmadaw had to control the conditions in 1988 due to general discontent. The Tatmadaw had to make the step-by-step reforms in order to transform into the multi-party democracy system aspired by the people. The constitution was drafted after the National Convention was held with the people from all strata. Since 2011, the country started marching on the multi-party democracy path in accordance with the law. 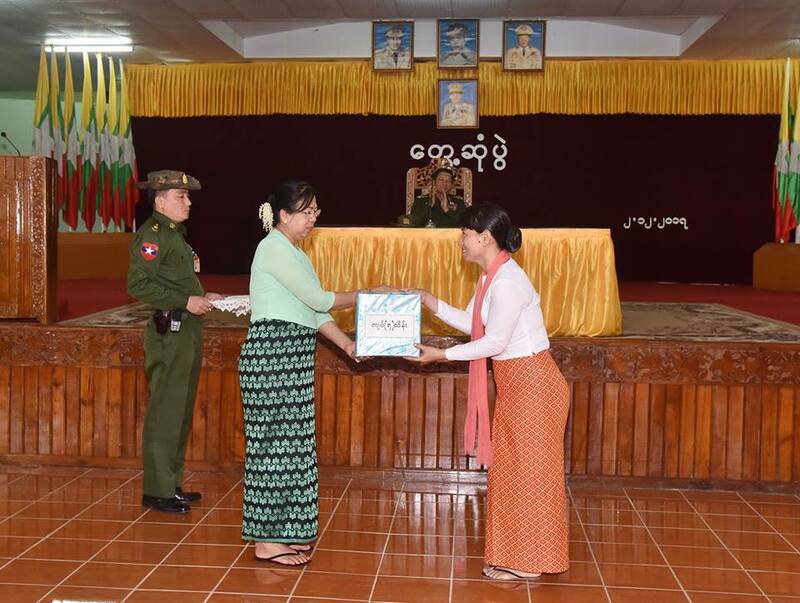 For local peace, the NCA was signed with ethnic armed groups. The peace-making process had to face difficulties as some ethnic armed groups wanted to get more rights. All were to be on the multiparty democracy path in accord with the law. The Constitution guaranteed the same rights for ethnic groups. Servicemen had to sacrifice their life for the perpetuation of sovereignty. We needed to conserve cultural heritage. Servicemen need to be equipped with three capabilities—military, organizing and administration. 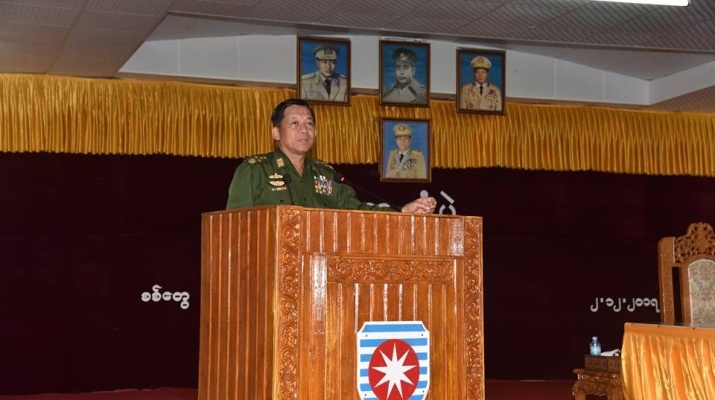 The Senior General continued to say that the attacks of ARSA extremist Bengali terrorists in Rakhine State were due to the weaknesses in the enforcement of law. Without accepting legal measures, those Bengalis came to breach the laws and carried out terror attacks against ethnic people. They are found to have shown no respect for law. As they did not accept legal measures and violated the law instead, such terrorist attacks had surfaced. Their unwillingness to accept verification process in line with the law had badly harmed the rule of law. In pursuing the democracy road, we must act in accord with the law. It is important to ensure stability in terms of politics, security and rule of law. We must make sure that there is no disunity stemming from instigation. We all need to have Union spirit. Our national brethren are living in the same land and drinking the same water. They must try to develop their own regions. 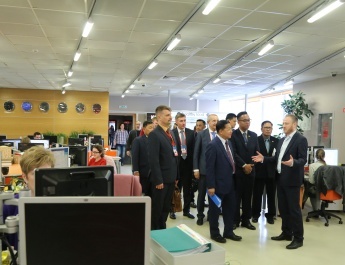 It is also necessary to develop own military units and then their respective regions. Basic education plays an important part in making the Tatmadaw a standard army. This is why measures are being taken to promote the education of Tatmadawmen. Meanwhile, plans are being carried out to improve their heath as well as their living conditions. It is important for individual Tatmadawmen to be well-disciplined. A lot of measures have been taken to improve the life of the people. Due to such efforts, public trust and confidence have been won. The result was thanks to the participation of all and it must be maintained in the long run. The Tatmadaw will become strong through good discipline, high morale and unity. The unity within a region can be forged through the unity within a military unit. Then we will be able to build national unity. The Tatmadaw is also carrying out welfare tasks. Tatmadawmen for their part need to implement agricultural and livestock breeding tasks, thus contributing to their own region. Moreover, self-indulgences must be avoided. Afterwards, the Senior General presented knowledgeable publications to the officers and other ranks and their families from the station. The Senior General’s wife presented cash donations for the fund of maternal and child welfare. The regional control command commander and wife accepted the donations. 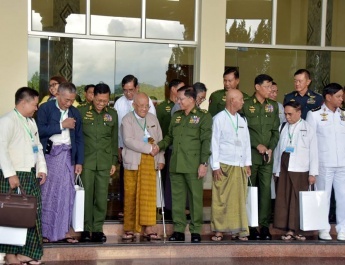 Then, Commander-in-Chief (Navy) Admiral Tin Aung San and Lt-Gen Aung Kyaw Zaw of the Office of the Commander-in-Chief (Army) presented food and sport equipment to concerned officials. After the meeting, the Senior General and party cordially greeted the officers, other ranks and their families.